There are a number of reasons as to why the great helm earned its name, although the least of which is probably because helms like this Over Wearer Great Helmet made the wearer look like a great, powerful, and intimidating warrior or knight. Often worn over a smaller helmet, the Great Helm offered great reinforcement against weapon penetration. 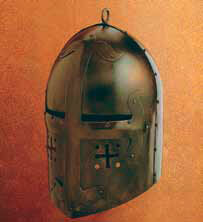 These helmets were common in the Crusades among knights and European armies and are sometimes referred to as "Crusader Helmets". Heavy duty 16 gauge, inner liner for comfort. Rounded skull and pointed crown, with oval finial. This page was last modified on 4 May 2014, at 18:38.